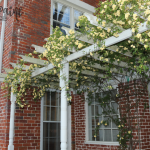 In spring, the lifeless grass begins to turn green, azaleas bud and slowly open to beautiful, colorful flowers and the sounds of birds fill the air. I love working in my yard and the warmer, longer days allow me to spend more time outside. Our neighborhood seems to have a mass exodus around this time of year where everyone is finally coming back outside and enjoying the spring season. 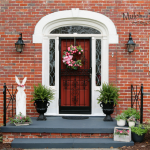 Inside, I like to fill my home with brighter colors that mimic what is happening outside. 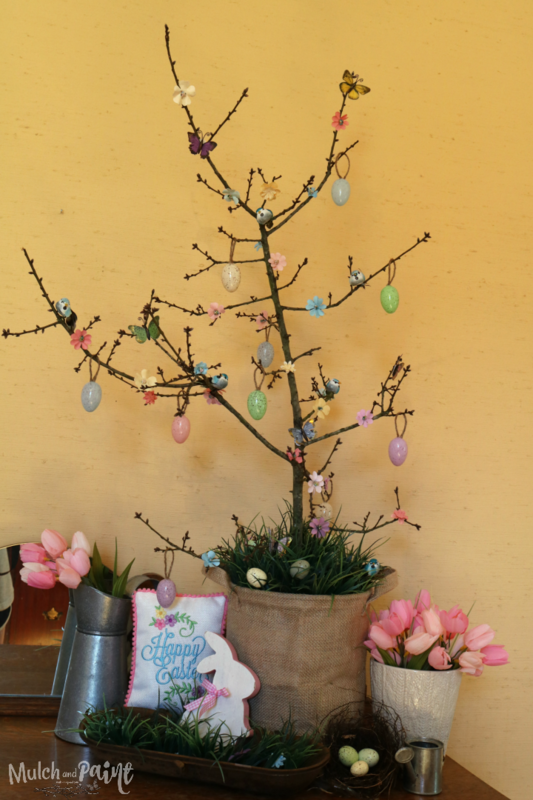 Easter trees seem to be the perfect addition to bring spring indoors. 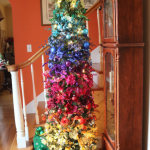 You can easily buy trees and ornaments but why do that when a little imagination and effort can produce a one-of-a-kind tree for you and your family? 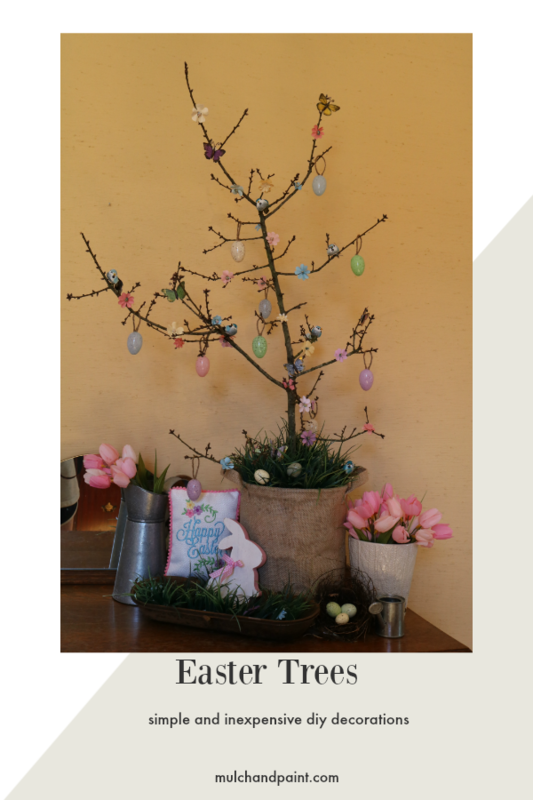 A tree fell in our back yard during a storm and the limbs were shaped so well that I picked up a few of them and decided to use them for my Easter tree. 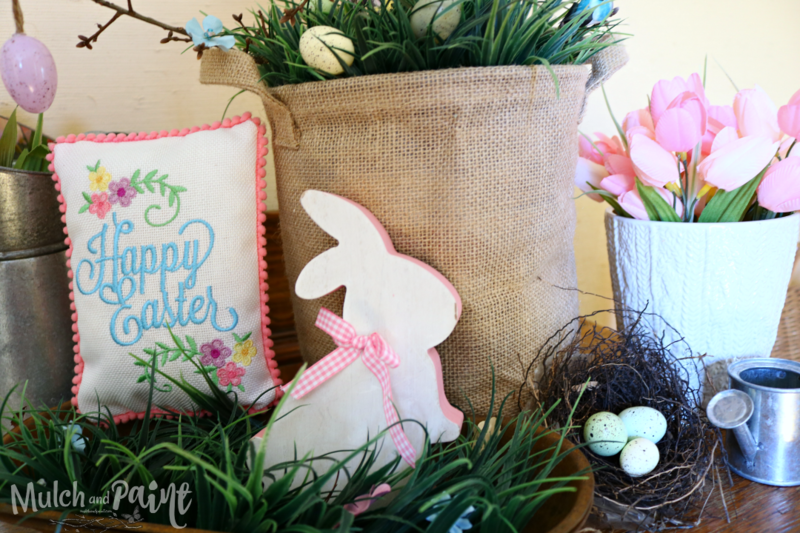 I bought an inexpensive burlap bag at Hobby Lobby for my base. 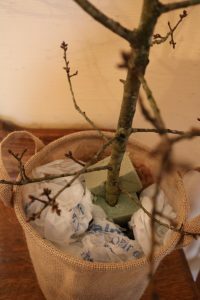 Using floral foam blocks from the Dollar Tree and shopping bags, I made a support for the tree limbs. 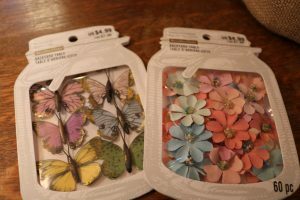 I bought these cute little butterflies and flowers from Michaels. (I bought them when they were 50% off.) They were in the scrapbook section. 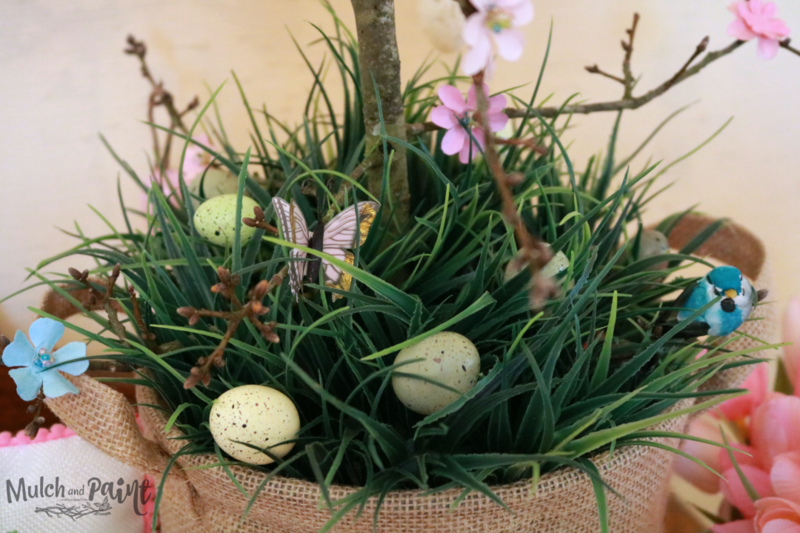 I used glue dots to attach them to the branches but you could also use hot glue or craft glue. 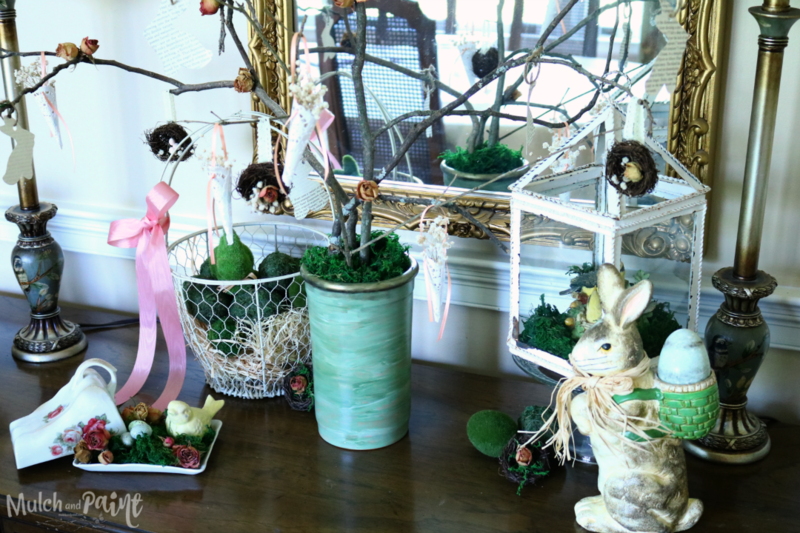 I found these little plastic robin eggs at Hobby Lobby. A little twine hot glued to them made a loop to hang them on the tree. 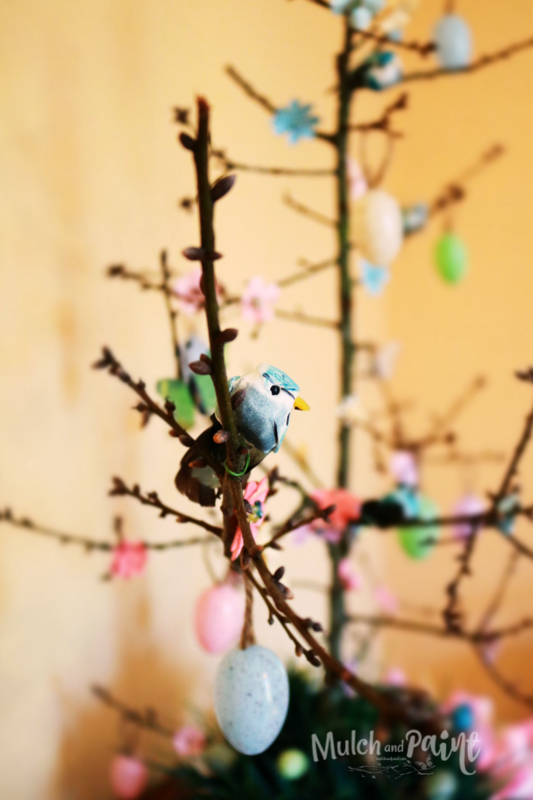 I also purchased a package of blue birds that I wired on the tree. Here’s a close up of one of the birds. I do most of my seasonal purchases after the season/holiday has passed when the prices are up to 90% off. A few years back, I bought a lot of “fake” grass squares and have not had a use for them…until now. 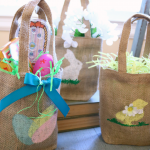 I cut them up into smaller pieces and they worked perfectly in the burlap base. I threw some eggs on the grass and was happy with how it turned out. Here’s a closeup of the other decorations. 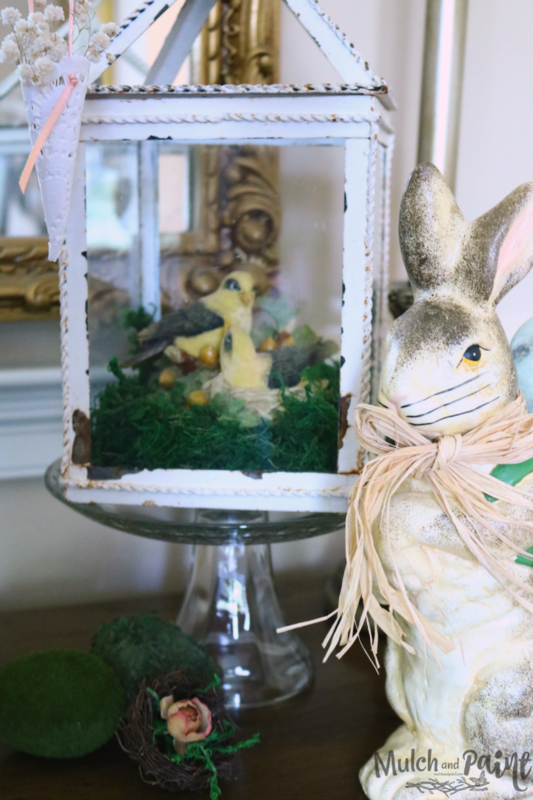 I found the little wooden bunny and Easter pillow at Hobby Lobby last year after Easter. The tulips came from Michaels this year…they were only $2 a bunch. I used two bunches for this area. I also made a Victorian Tree for my dining room. 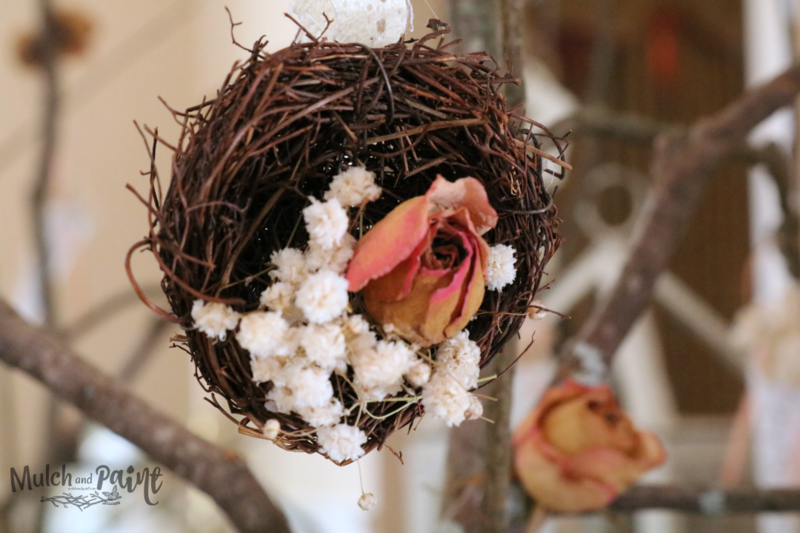 Dried roses and baby’s breath glued onto purchased bird’s nests and hung with lace ribbon. 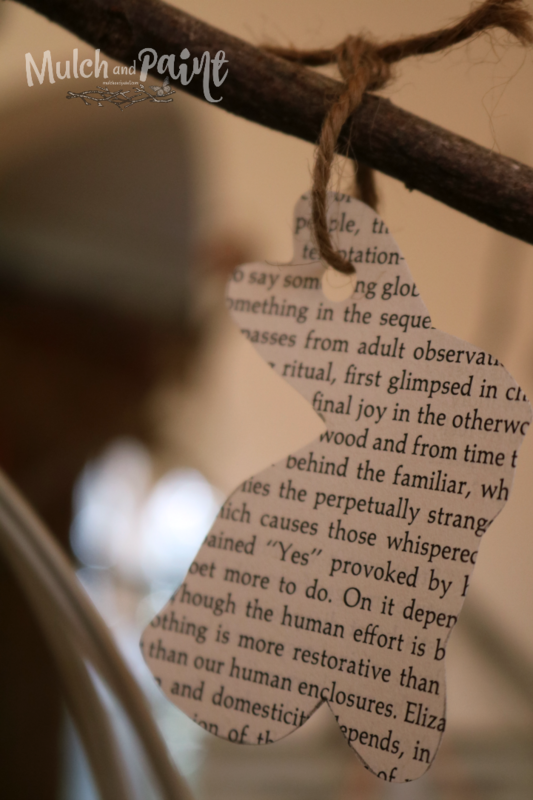 Bunny ornaments cut from book pages and hung with twine. Tussie mussies made from doilies. These are heart shaped that I got after Valentine’s Day. I rolled them up and taped them with clear tape on the back. 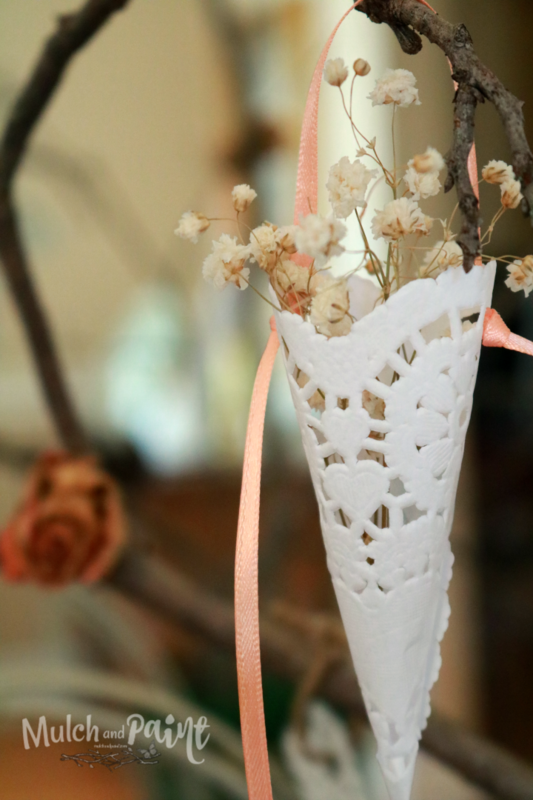 A sprig of baby’s breath and some peach ribbon completes the ornament. I painted a terra cotta vase with multiple green paints and accented the top and bottom with gold paint. 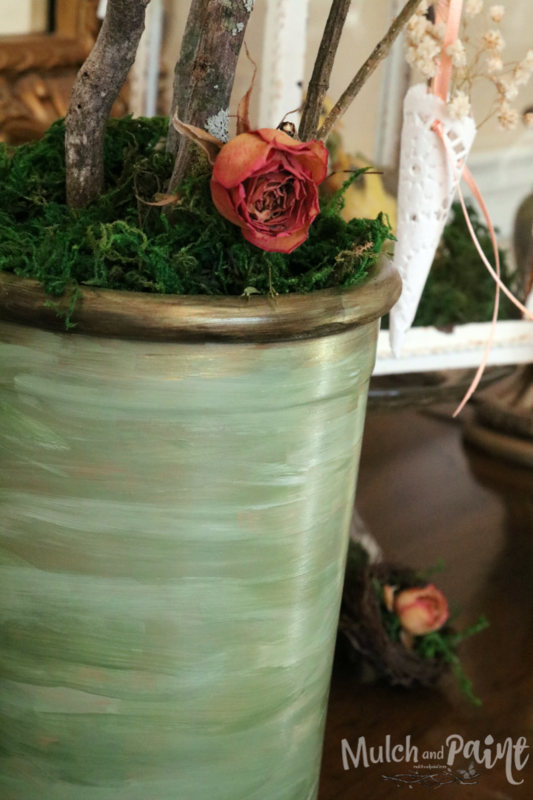 Dollar Tree moss was packed into the vase and a dried rose was stuck in for more color. 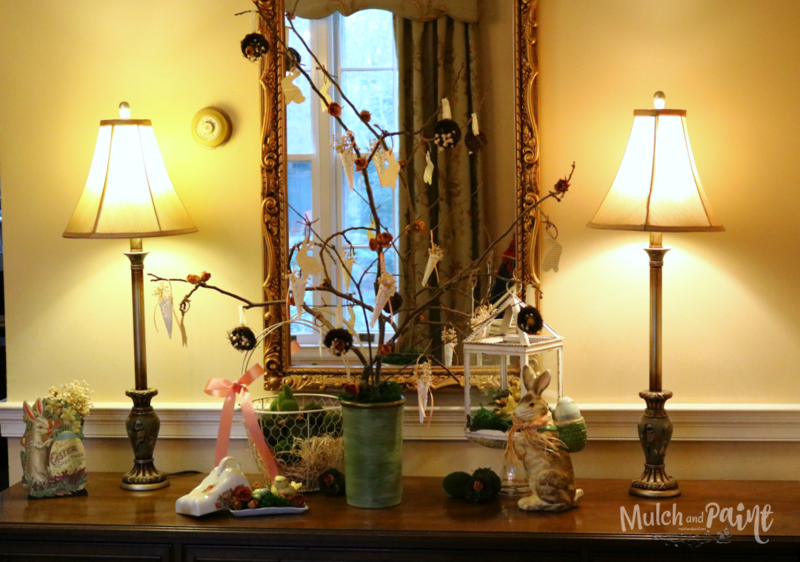 It was hard to get good photos of this tree because of the mirror behind it and the large window in my dining room. I apologize for all of the quirky angles and lighting issues. Finally, here’s my “Tacky Tree”. I named it this because my goal was to use bright colors and a little glitter here and there. 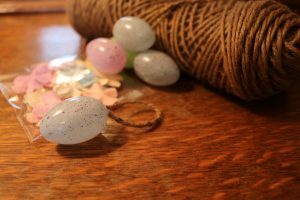 I took traditional Easter eggs and glittered them with some craft glue and glitter. A little strand of fishing string made the loops to hang them on the tree. 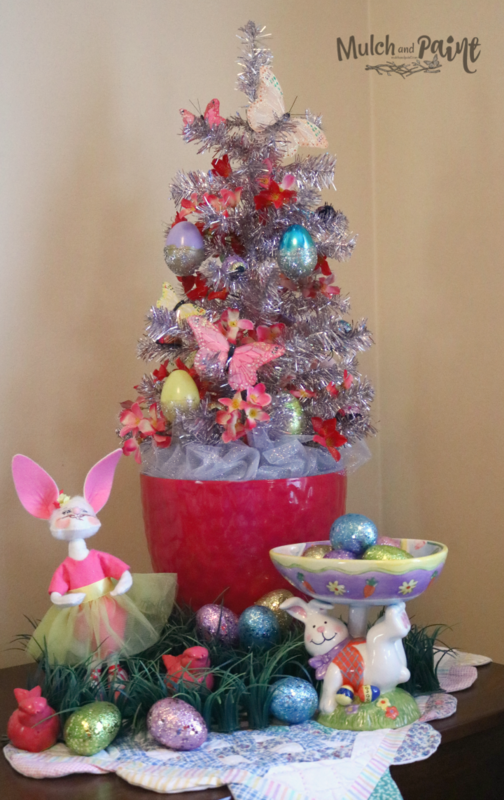 The tree itself is a small Christmas Tree with a slight purple-silver tone. I got it at Fred’s after Christmas for $2.50. 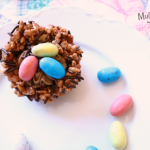 The glittered eggs sitting at the base are from Walmart-$1 for a bag of 12. I found a package of butterflies in the basement that I had used on a birthday cake for Mary’s birthday around 10 years ago. 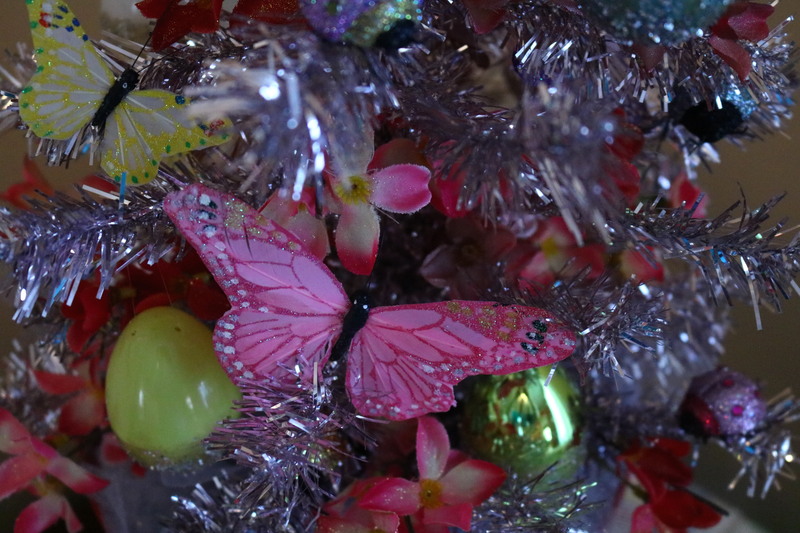 The silk flowers I found were lightly painted with glitter spray for more sparkle. 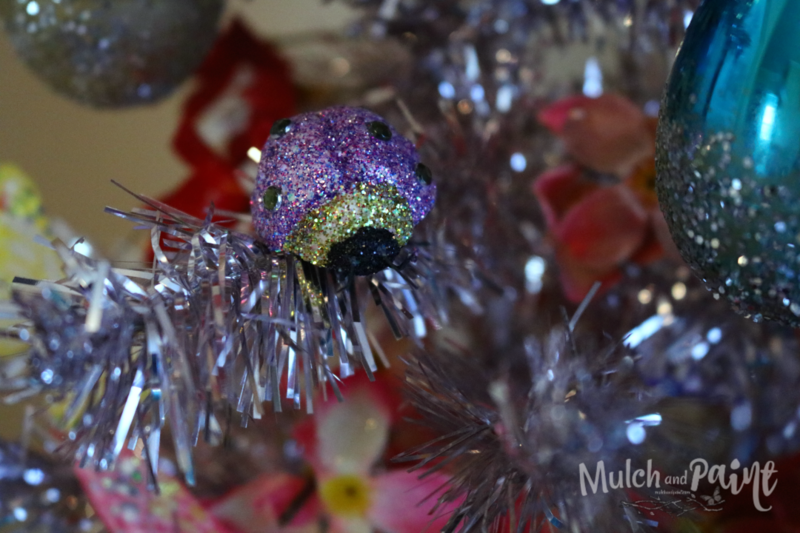 The glittered ladybugs are actually magnets I’ve had for a few years. Basically, I just went around my house looking for things that were bright and/or glittered and used them. 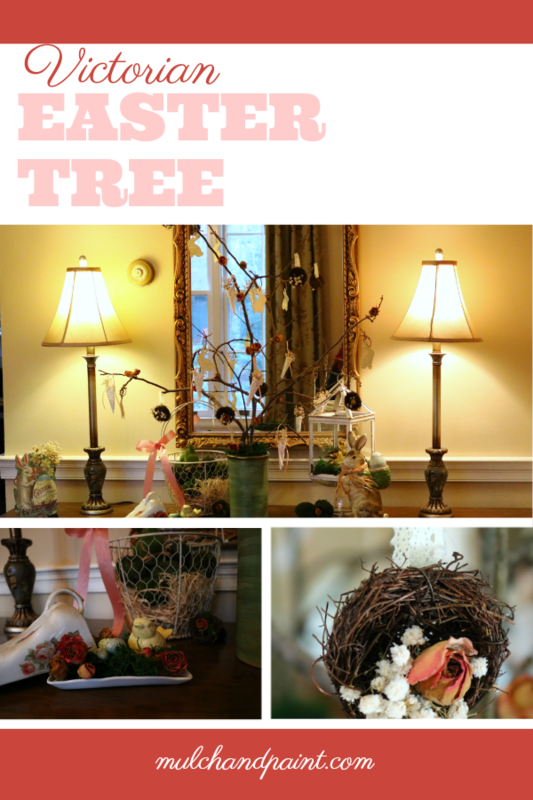 I just think Easter trees are so much fun and add instant happiness to a room. 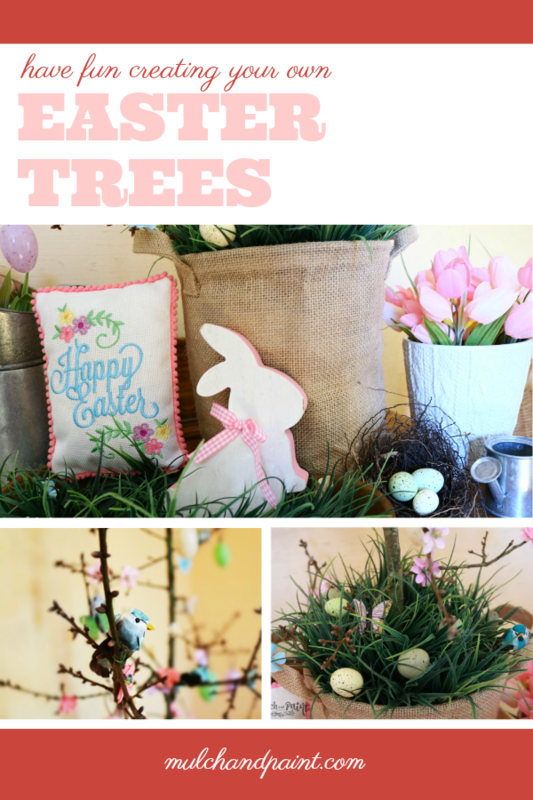 I hope I have inspired you to go grab some sticks and look around your house for everyday objects you can make into ornaments. 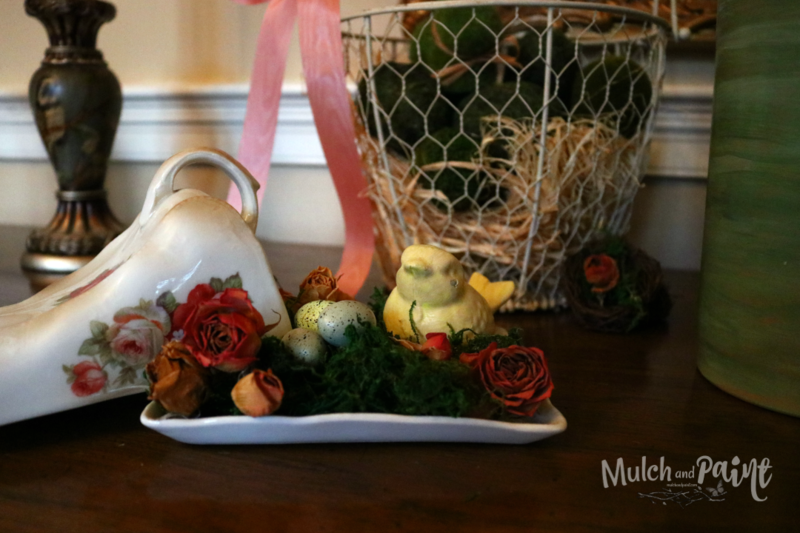 Bring a little spring inside! 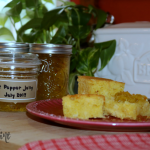 Thank you for taking the time to stop by! I hope you have a blessed day and remember to take the time to enjoy this beautiful change of seasons.